The above definition is all very well but in my opinion it is impossible to restore a watch to it’s original factory condition. 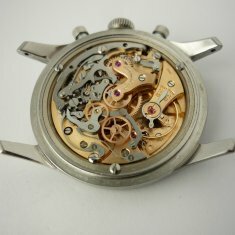 The exception may be if the watch is returned to the factory of origin where they fit new old stock parts including dials and not modern replacement parts, such as the restoration of the existing dial. Superlative Times’s perspective is that we try and sell watches as close to original as possible, which is what all reputable dealers want to do and all collectors want to buy. The most important part of the watch is the dial and there the value lies, therefore on rare and high value items it is best to leave well alone and do as little refurbishment work as possible. Whether we undertake work for a customer or our own stock, we have to take into consideration how far to go with the restoration so as not to de-value it yet still make it pleasant to wear. 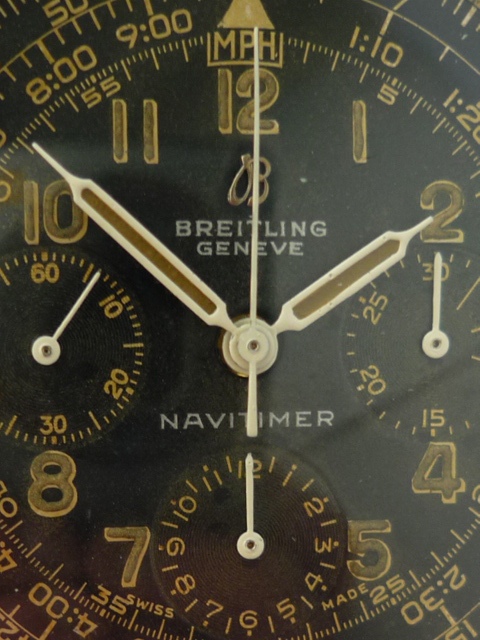 I have chosen this early Breitling AOPA/ Navitimer 806 as an example of the work we can do. 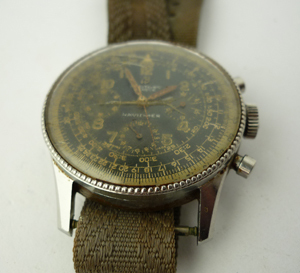 This watch was purchased on Ebay from the USA with the intention of bringing it back to life so that someone else could enjoy wearing the watch for another 50 years. 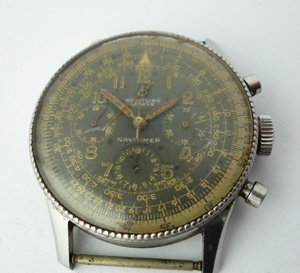 The seller had inherited the watch from a relative who actually used the watch when navigating in B52’s during the 1950’s. He had decided to cash in rather than having it restored. 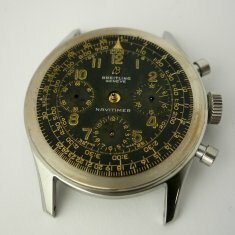 I have owned one of these before and knew that the dial configuration was rare (small B). I took a chance that underneath the grime and scratched glass was a good dial . For those not familiar with the process of Selling/Restoration or Refurbishment the following photos will give you an insight into the process. As you can see the glass is badly damaged and discoloured, you can just about determine the condition of the dial, slide rule and hands. On the case lug at 4 o’clock I noticed some damage, a small dent. The hands needed tidying up and though the slide rule was also discoloured but not damaged I felt that it was going to be OK. From this angle it looks like a dirty case with a few scratches, the lugs look fairly sharp and defined, no signs of over polishing. Case back free of dents, serial number on the inside, again more dirt than damage or corrosion. The pushers are not damaged. 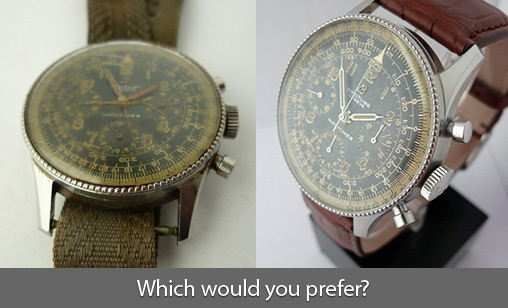 RIGHT: These early AOPA/Breitling cases had a movement ring that was secured to the middle section by 3 screws. The Rice bezel snapped onto a thin ring that slotted between the middle section and movement ring. Photo shows all components in good condition, though require cleaning. Notice in this photo the small indentation on the lug. 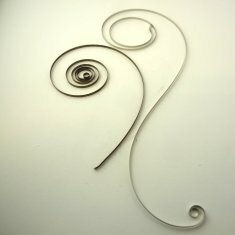 LEFT: Photo shows the original mainspring on the left with a brand new one pictured on the right. Notice the difference in the two. The original is ‘dead’ no power left to drive the movement, the new one recoils back on itself so has the strength to power the movement until the next service. Middle section stripped of pushers and pendant tube for refinishing. Parts cleaned ready for assembly. 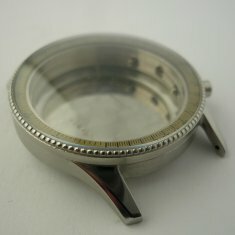 Photo shows the middle section, ring, movement ring and bezel in order of assembly after polishing and cleaning. Final process all components together waiting for the movement to be fitted. before fitting in the movement. LEFT: Rear photo of movement fitted into case, you can see the 3 movement ring screws and also the 2 screws that retain the movement onto the movement ring. LEFT: Photo showing assembly of movement and dial without hands. I prefer to fit the hands, and in this case, the chronograph hands whenever possible whilst the movement is fitted into a case. It allows me to test the chronograph mechanism using the pushers in a controlled way. The restored hands are fitted.